Hell Freezes Over: Kraftwerk In Nashville!! A glimpse at their home page revealed the clock-stopping truth. Kraftwerk were indeed trodding the boards across North America this Fall, with the band in Philadelphia a scant four days after we’re there in September. It’s the usual mix of Kraftwerkian strongholds [Miami, Detroit] salted with some of the more… unflinching excursions into virgin territory I’ve yet seen from the Düsseldorf foursome. One date in particular, burned its location into my retinas. On September 27th, 2015, Kraftwerk will perform at the Ryman Auditorium in Nashville… the Literal Home of The Grand Ole Opry and the Spiritual Home of country music itself!! That soul-shattering sound you’re hearing now is not Godzilla advancing on your hamlet. It is not the sound of the earth being wrenched from its axis. It is a tearing in the very space-time continuum itself! See for yourself… if you dare, here. I can’t say who is ultimately responsible for this senses-shattering event, but my Aztec Energy Dome® is well and duly doffed at the way that they obviously plowed ahead with this notion indifferent to the carefully ordered matrices of Reality Itself which would be obviously torn asunder by such an event. The Great Tribulation could clearly begin at any moment now. Here is the full tourbook for the rest of 2015 for the peripatetic foursome and their next booking sees them playing this year’s Tour De France, naturally. 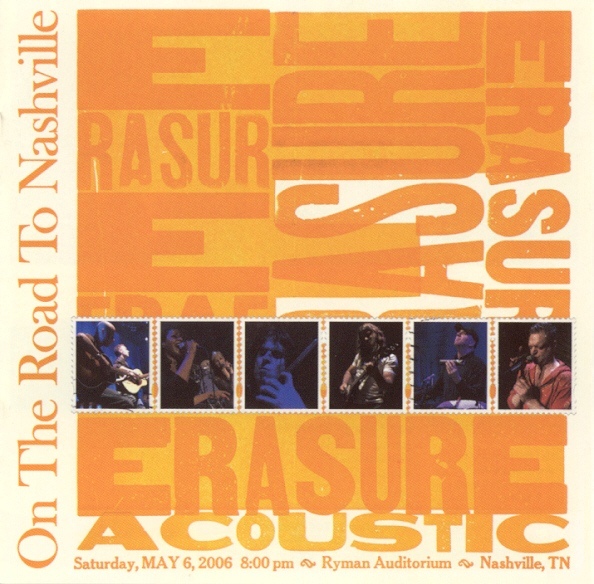 Of course, synth duo Erasure broke this hallowed ground in 2006 with their CD/DVD package, “The Road To Nashville,” but they chickened out and performed an acoustic show with guitars to match! No such compromise for Kraftwerk! They are taking their mission straight into the belly of the beast! I hope that they can withstand the ghosts of country music past haunting their nightmares until the end of their days. We shall see in September then, eh? As for Kraftwerk themselves, they are on a high these days. I’ve been pretty critical of their music of the last 29 years here, but the exercise of their Katalog shows, as well as advances in technology mean that today Kraftwerk are putting on a fantastic show with plenty of diversity and inventiveness. I saw three shows back to back at Moogfest 2014 and they shocked me with how different each one ended up being. The Katalog residencies mean that multiple versions of any song they released after 1974 can be performed in their sets, which places them in a good space for growth by mining their past, if they want to open themselves to it. Time, and the next Kraftwerk album [should there be one] will tell. If you’ve never had the pleasure, by all means everyone should see Kraftwerk at least once now that it is a going concern. The Kraftwerklivemusikdraught of 1981-1994 has been laid to rest with the diligent push of the band to leave their reclusive studios and travel the world’s stages. This entry was posted in Core Collection and tagged 2015, Canadian Content, Concert, Kraftwerk. Bookmark the permalink. 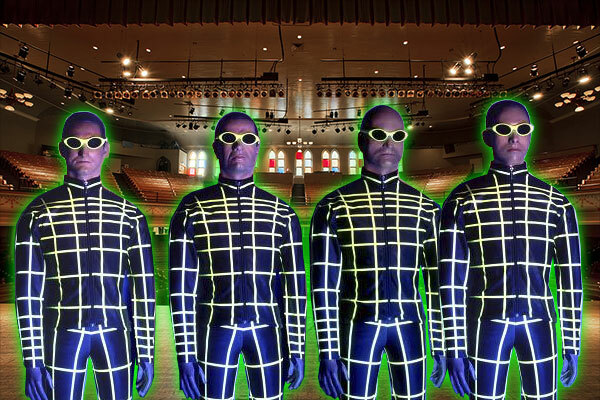 5 Responses to Hell Freezes Over: Kraftwerk In Nashville!! Hmmm…Miami in September…I think that will work for me. Echorich – Yeah. It’ll probably only be 98 degrees instead of 101! I almost saw Kraftwerk in Miami. They were supposed to play there in ’90-’91 and we had tickets, but the show/tour was cancelled. It would remain until 1998 until I finally saw them. Makes my decision to forgo the LA show last year, a good money saver. As well, if Tour De France will be the focus, I will be on the edge of my comfortable seat. Have you noticed where Kraftwerk are *not* playing? New York. Chicago. Los Angeles. San Francisco. They’re skipping all the big markets for some reason. Tom Waits did the same thing a few years ago. JT – I think they have a deliberate market penetration plan that will see them eventually covering the earth. Then, when Ralf is gone the next generation [or just the robots] will continue until Kraftwerk become a worldwide brand; larger than even their position in the scope of pop music.